Live smarter with news you can use and info on social media trends. The Supreme Court of India today passed a historic ruling on Aadhaar - a 12-digit unique identity number that can be obtained by residents of India, based on their biometric and demographic data - to set to rest which institutions can ask for "Mandatory" linking to the controversial project launched under the Unique Identification Authority of India. 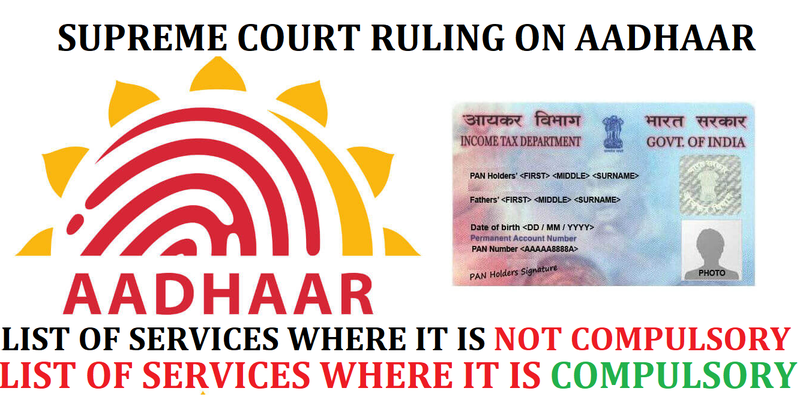 The court, putting in simple terms, said that Aadhaar or Aadhaar card is basically a mechanism to help the marginalised sections of the society by directly reaching out to them with social benefits while taking into account the dignity of the individual not only from personal but also from a community point of view. While social media is abuzz with confusion over linking and interlinking of Aadhaar with banks and mobile phone numbers, Socialmediawatchdog.info gets down to work to find out what's mandatory and not mandatory for you as an individual. The Supreme Court ruling in Aadhaar case is this: Aadhaar is constitutionally valid, but not mandatory for all services. 2. Mobile phone numbers: Interim order of the court had ruled that Aadhaar was mandatory for applying for new SIM card and also for existing mobile number holders. Today's ruling said mobile numbers need not be linked with Aadhaar. 3. Schools: The Supreme Court is very clear on this. It said, “Education will not be denied to any student in the event of no Aadhaar.” In addition, the apex court said social schemes provided in schools cannot be denied to any child on the basis of 'no Aadhaar'. 4. Examination: The court said that students appearing for Central Board of Secondary Education and NEET exams will no longer need Aadhaar. 5. Private institutions: The court said that schools/private companies cannot insist on Aadhaar and read down Section 57 of the Act, barring sharing of information with corporate bodies. List of services where Aadhaar linking is Mandatory. 1. You must link your PAN (Permamnent Account Number) with Aadhaar. 2. Aadhaar is also mandatory for availing facilities under government welfare schemes and subsidies. So, if you are a beneficiary, you must link Aadhaar number. 3. Aadhaar number is mandatory for filing income tax (I-T) returns. Kindly share this post with your friends so that they will know how and with whom to share their unique and private personal data that are available with Aadhaar.